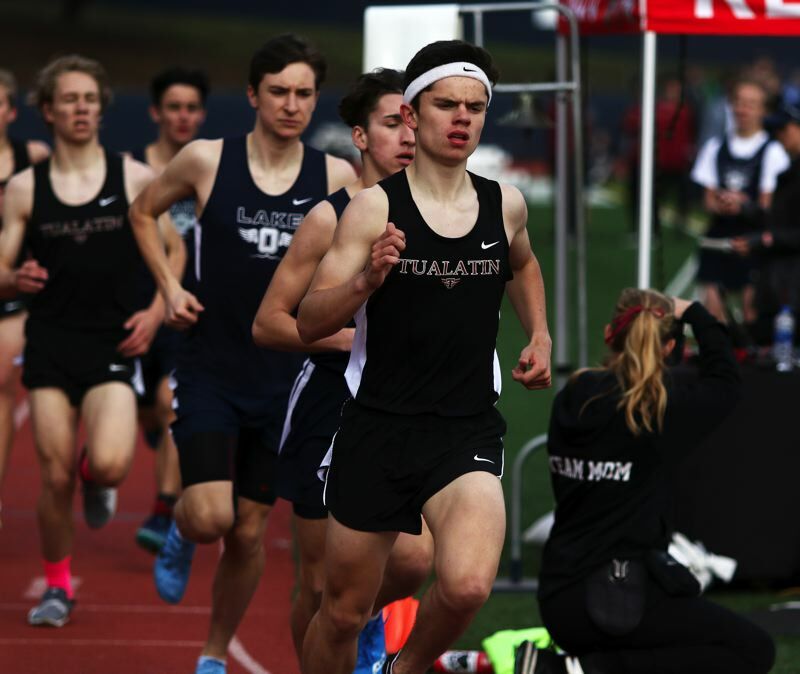 LAKE OSWEGO — The distance runners on the Tualatin High School boys track and field team set a simple strategy. Win the 800-meter run, win the 1,500, win the 3,000 — win the meet. Well, the Timberwolves' plan worked to perfection. Tualatin, having first-place finishes in all three distance events, as well as many other victories, sprinted to a 97-48 win over Lake Oswego in a Three Rivers League dual meet opener held Wednesday at Lake Oswego High School. "Getting the win was important," said Tualatin junior Sam Smith, who ran to victory in the 1,500. "We're kind of doing a little thing with our team. Andrew Payton is shooting to win the 800, Ethan Klein is going to win the 3,000 and I was going to win the 1,500 — one, two, three. We want to sweep those events." With the team win, the Wolves, who have high hopes for the season, got off to a 1-0 start in TRL meets. As for the distance runners, they certainly did their part in the win over the Lakers. Smith was up first as Tualatin went for the distance sweep. "Yeah, there was a little pressure on me," Smith said with a smile. In the 1,500, Smith took the early lead, but, for most of the race, he had Lake Oswego's Jacob Peterson and Ben Atlman close — really close — behind him. But that didn't seem to bother Smith. "I always have a strong kick, so I wasn't worried," he said. "I was going for the win." And he got it. Pulling away over the last 200 meters, Smith won the race in a time of 4 minutes, 33.11 seconds. Peterson was second at 4:34.35. "It was good," Smith said of the victory. "I felt like I was really smooth and I really focused on my form." In the 800, Payton ran to first place in a time of 2:00.06. Klein competed the distance sweep, triumphing in the 3,000 with a mark of 9:28.24. 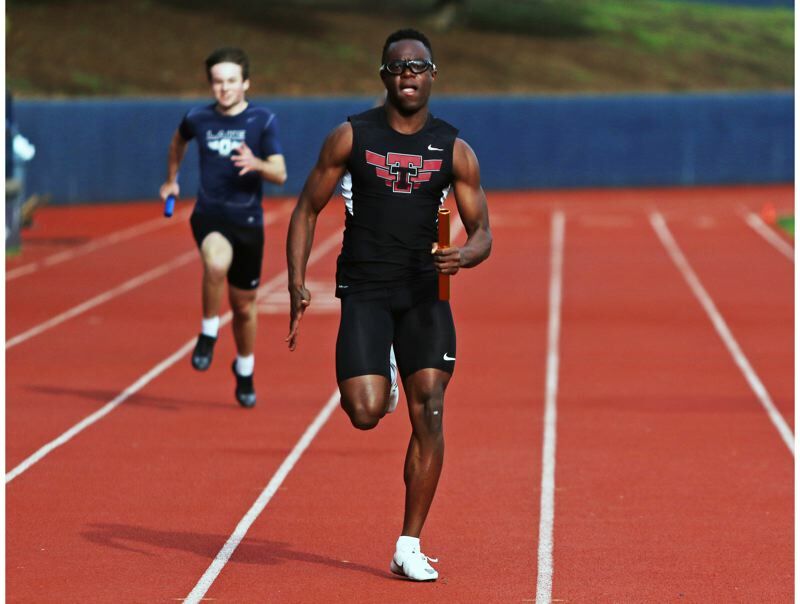 Tualatin senior Kwabena Lynn had a big meet for the Wolves, as he was a four-time winning. Lynn sprinted to victory in the 100 in a time of 10.97 and he had a winning mark of 22.71 in the 200. 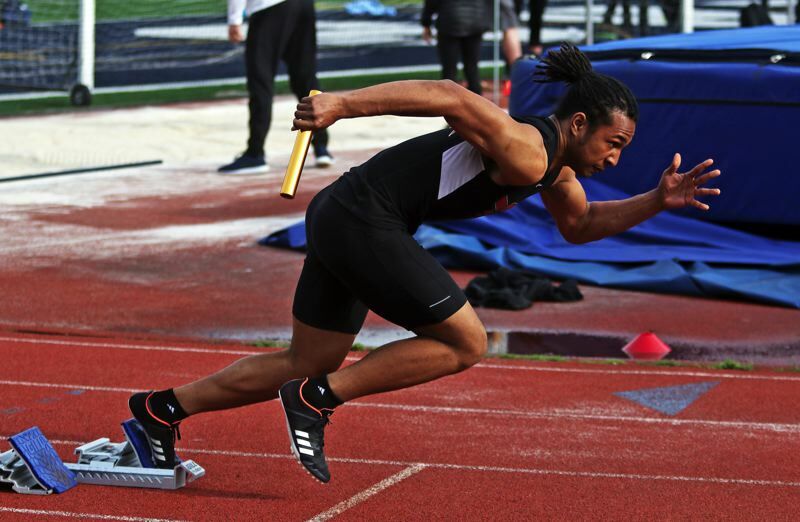 In the 4 x 100 relay, Lynn teamed with senior Dominique Loggins, senior Jake Anderson and junior Luke Marion to win in 43.90, despite some handoff problems. In the 4 x 400 relay, the team of Lynn, junior Sam Katsuda, junior Andrew McDade and senior Derek Leneve triumphed in 3:40.86. Also on the track for the Tualatin boys, McDade won the 400 in 51.67, junior Malcolm Tatum took first place in the 110 high hurdles in 16.76 and Katsuda had a winning mark of 42.03 in the 300 intermediate hurdles. Tualatin senior Nano Kis, the defending Class 6A state champion in the discus, won that event with a throw of 164 feet, 7 inches. He also took first place in the shot put with a mark of 53-6.75. Timberwolf senior Jalen Hale had a winning distance of 20-8 in the long jump. 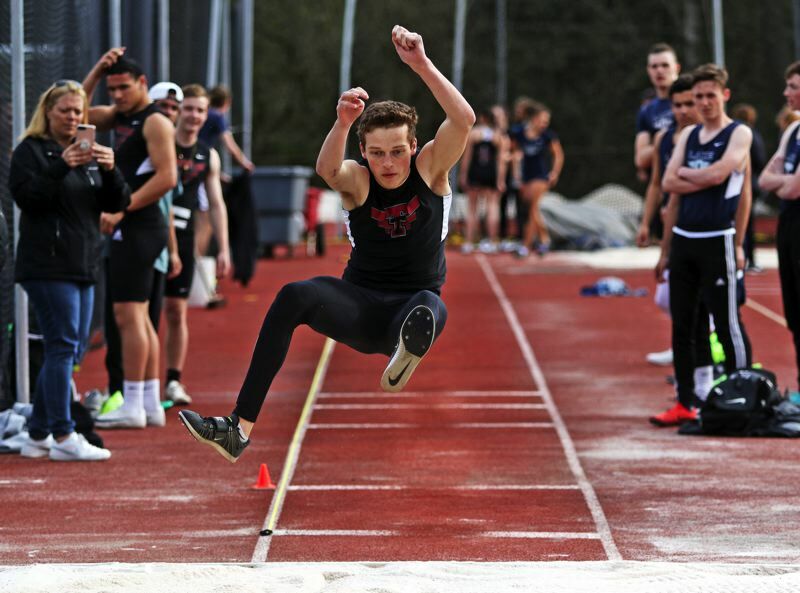 The Tualatin boys will be back in action on Friday, when they compete at the Chehalem Track and Field Classic, which will be held at Newberg High School. The Wolves will return to Three Rivers League competition on Wednesday, when they host Lakeridge in a meet at Tualatin High School. Field events start at 4 p.m. and track events begin at 4:30 p.m.